The Farrell Law Firm delivers a personalized strategy when helping our clients plan their estates. We never take a one-size-fits-all approach to crafting an estate plan. We custom-tailor an estate plan for you. We wrote the book on estate planning in Georgia. Receive a free copy of John's book, Estate Planning for the Modern Family: A Georgian's Guide to Wills, Trusts, and Powers of Attorney when you appear for a free consultation with our office. Hear what others have to say about our services on our Testimonials page. Planning Your Legacy and Estate in Georgia? Our experienced Marietta estate planning lawyers help preserve your family’s future. If you are looking to plan the distribution of your estate with a will or trust, dealing with a probate issue or proceeding, or navigating Medicare planning, Marietta-based Farrell Law can help. · Assuring your wishes are carried out quickly and meticulously. · Minimizing your assets’ exposure to risk with a flawless transfer. · Protecting the security of your family and heirs. 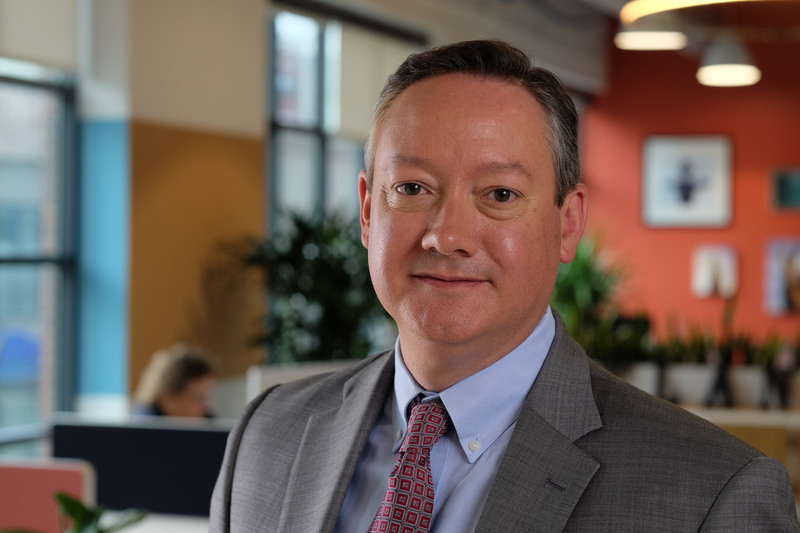 Led by firm founder, John P. Farrell, our estate planning attorneys fastidiously learn each client’s needs and then develop a customized and precise estate plan to carry out their estate distribution wishes, preferred healthcare directives, and otherwise protect and preserve your wealth. Whether you need a will, a trust, help with a probate or assistance in avoiding probate altogether – our Marietta-based lawyers know the ins and outs of creating a turbulence-free estate plan. Licensed in Georgia, Tennessee, and Texas, our practice has grown through referrals of satisfied clients, referrals from other lawyers who know how to find the best estate planning lawyers in Georgia and Tennessee, and the community where our reputation speaks for itself. "Excellent," "courteous," "professional." These are not our words. They are Client Testimonials after working with Farrell Law. They illustrate both past successes and, more importantly, what we at the Farrell Law Firm strive for - every client, every day. 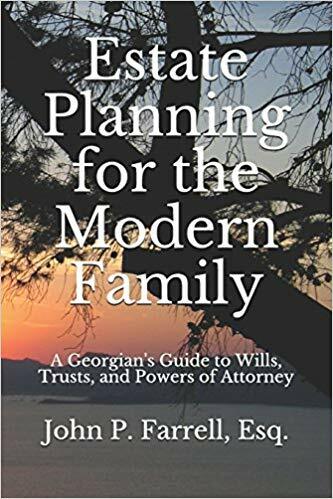 Written by firm founder, John P. Farrell, Estate Planning for the Modern Family: A Georgian's Guide to Wills, Trusts, and Powers of Attorney provides a step-by-step guide to Georgia estate planning. Want to Preserve Your Georgia Estate & Legacy for Future Generations? The Farrell Law Firm delivers a personalized strategy when helping our clients plan their estates. At the Farrell Law Firm, we help you achieve your unique goals in estate planning, whether that includes providing for a loved one with special needs, preserving your child’s inheritance after divorce, or documenting your healthcare wishes in the event that you become disabled. We can do this because we never take a one-size-fits-all approach to crafting an estate plan. We custom-tailor an estate plan for you. When considering end-of-life scenarios, careful estate planning can be as important as accumulating wealth was in the first place. The goal of financial certainty and control should not collapse due to an unforeseen event, lapse in health, or untimely passing. Through foresightful estate planning, our clients can protect and preserve their assets for chosen beneficiaries. Thereafter, those assets can be transferred during life or upon death to achieve a set of pre-established goals. At the Farrell Law Firm, we employ sophisticated, creative, and innovative planning methods to solve complexities and meet our clients’ objectives for their own estate. If you have questions about estate and trust law, contact the wills, trusts, and estate planning lawyers at the Farrell Law Firm. If there are multiple wills, no trust, or no will at all when your loved one passes away, you could be left battling for your fair share of the inheritance. There can be a wide range of things you will need to do to properly determine the matters of the estate. Working with a competent Marietta estate planning attorney can help ensure you are taking the right steps and that your rights are properly defended. The Farrell Law Firm can provide you with thorough details about what steps you should be taking following your loved one’s passing and what is happening with the court. Probate can be a confusing and time-consuming process that some people try to avoid. While probate is not always necessary, it is common for families to undergo probate if the deceased owned assets solely in his or her name and there is a great deal of uncertainty on how to divvy up the assets. For many people, probate disputes can be emotional and hard to quickly resolve. These disputes can be made more difficult since they often involve family members or people whom you have a close association with. Having representation from an educated probate lawyer in Marietta can help to resolve these disputes in mediation or in the court. At The Farrell Law Firm, it’s our goal to make sure that the legacy of your loved one is properly preserved. We can help you file the proper paperwork with the court to make sure their estate is being properly cared for and advocate on your behalf in litigation. Probate can be a time-consuming process but we can help make it easier for you. Contact our firm at (678) 809-4922 for more information about how we can help you! Getting your affairs in order is an easy three-step process, which takes 3-4 weeks to complete. At the initial client meeting, we will take the time to learn your estate planning goals. Once the documents are completed, we will send you drafts to make sure they are 100% perfect. At the final signing meeting, your signed documents will be put into an Estate Planning Portfolio for safekeeping. Our experienced Marietta estate planning lawyers help preserve your family's future. Qualified Lawyers with 15 years of experience. We had a fantastic experience with John handling our estate plan. John is extremely patient and answered all of our questions in terms we could understand. We were made to feel comfortable throughout the entire process and were blown away by the professionalism and expertise of the entire team at the Farrell Law Firm! – Scott & Lindsay O. We began the Will process with very little prior knowledge of Wills or estate planning. We were grateful to work with John Farrell! His ability to explain all of our options in terms we could understand was very valuable to us. It gives us great peace of mind to know our affairs are in order when the need arises. – Wade & Cyndia D.
We were grateful to work with John Farrell ! We certainly enjoyed our participation with John Farrell in our estate planning. John’s knowledge and experience led to a seamless transition for us. Everything was distilled to one notebook for easy usage. Well done ! John was extremely knowledgeable of Federal & State laws, procedures & processes. He guided us in our questions & simplified terminology, so that we could fully understand. We felt very comfortable with a sensitive process & would highly recommend John to anyone. The value for the money spent is high and the final estate planning portfolio was impressive. Thank you! – Rich & Linda G.
John was so polite and professional. He spoke to me in layman’s terms. He answered all my questions. He didn’t hurry me. Mr. Farrell was a joy to work with, well able to advise, punctual, prepared, meticulous that all changes to my Will be satisfactory and he was just plain nice. I would recommend him to anyone. It was a job well done for a reasonable price. John Farrell is an extremely personable, knowledgeable attorney who does a wonderful job. He is patient with clients and takes the necessary time to explain the estate planning process and documents. – Herb & Lynn F.
Our search for an attorney to handle our Wills, Advance Directives, and Estate Plan led us to Farrell Law. We found the knowledge and professional expertise we were looking for. The group meeting we attended was very informative, and our personal meetings have been well-organized and thorough. We have been able to place our full confidence in Mr. Farrell, and the location in Marietta is perfect for us. We are pleased that we chose John Farrell to prepare our legal documents and serve as our attorney. – David & Diane W.
We found the knowledge and professional expertise we were looking for. Are Handwritten Wills Valid in Georgia? Are Handwritten Wills Valid in Georgia? Handwritten Wills are valid in Georgia but I find that many people confuse handwritten wills with holographic wills. Become an Expert on Estate Planning in Georgia You will learn about Wills and Trusts, how to make your estate settlement simple, how to avoid probate and more !! 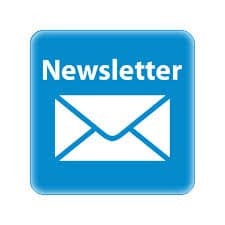 Once a month, you will receive our newsletter on estate planning. You can unsubscribe in one click.